Congratulations to graduate student Jon Churchill, who will present his research at the fall meeting of the Allegheny Chapter of the American Musicological Society, held October 17 on the campus of West Virginia University. His paper, "Vaughan Williams and Musical Safety: The Locus Amoenus in Symphony No. 3," was advised by musicology professor Charles Youmans. Jon is a second-year student in the M.A.-Musicology degree program. A native of Bethel, CT, he is a 2010 graduate of Western Connecticut State University where he majored in music education. Prior to his arrival at Penn State, he enjoyed an active and varied career teaching in a variety of capacities and performing across the country as a percussionist. Although most heavily involved in musical theatre, he appeared as principal or section percussionist with the New Haven, Norwalk, Ridgefield, Nutmeg, and Danbury symphonies, in addition to several wind ensembles, big bands, and choral groups throughout New England. A founding member of the Invicta Duo, the group twice won the James Furman chamber music competition, and performed at meetings of the Percussive Arts Society and the National Association for Music Education throughout the Northeast. As an educator, Jon taught instrumental music in the Bethel Public Schools (CT), at the King Low Heywood Thomas School (CT), and at Arlington High School (NY), in addition to his work with El Sistema programs and private students. As a member of the Invicta Duo, he presented masterclasses in the Connecticut public schools. In addition to his research, currently centered on Ralph Vaughan Williams and British Modernism, Jon serves as the historian of the Penn State Society of Music Theory and Musicology. 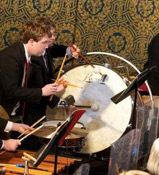 He remains active as a percussionist through performances with the School of Theatre and the School of Music Mallet Ensemble, and he has continued private percussion study with professor Dan C. Armstrong. After graduation, Jon looks forward to pursuing a Ph.D in musicology and teaching at the collegiate level.